Brenda Gayle Plummer. 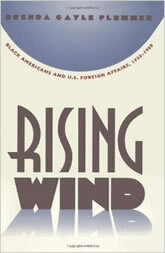 Rising Wind: Black Americans and U.S. Foreign Affairs, 1935-1960. Chapel Hill: University of North Carolina Press, 1996. African Americans have a long history of active involvement and interest in international affairs, but their efforts have been largely ignored by scholars of American foreign policy. Gayle Plummer brings a new perspective to the study of twentieth-century American history with her analysis of black Americans’ engagement with international issues, from the Italian invasion of Ethiopia in 1935 through the wave of African independence movements of the early 1960s. Plummer first examines how collective definitions of ethnic identity, race, and racism have influenced African American views on foreign affairs. She then probes specific developments in the international arena that galvanized the black community, including the rise of fascism, World War II, the emergence of human rights as a factor in international law, the Cold War, and the American civil rights movement, which had important foreign policy implications. However, she demonstrates that not all African Americans held the same views on particular issues and that a variety of considerations helped shape foreign affairs agendas within the black community just as in American society at large.